Three more states could prove likely candidates to legalize recreational cannabis in 2019. Uncle Sam may be poised to reform the nation’s marijuana laws. And annual medical marijuana sales in the United States are projected to drop for the first time in 2018 – but the decline is expected to prove short-lived. 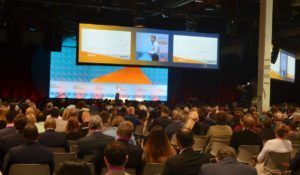 Those were just three of the predictions that came to light Wednesday on the first day of the annual MJBizCon in Las Vegas – with some marijuana reform at the federal level representing a potentially groundbreaking development for the cannabis industry. “I’ve been chronicling and analyzing this industry for the past seven-plus years, and for the first time I can potentially see a federal change coming within the next year,” Chris Walsh, founding editor and vice president of Marijuana Business Daily, told the conference. Overall U.S. sales estimates for the year were revised downward 5% compared to the original 2018 Factbook – from $7.9 billion-$9.7 billion to $7.4 billion-$9.3 billion. It’s important to note the decrease was largely driven by medical marijuana sales estimates in California since it appears the vast majority of customers are purchasing from the adult-use market, which wasn’t expected when the 2018 Factbook was initially published. For the first time, it looks as if nationwide medical marijuana sales will decline year-over-year from 2017 to 2018, but they are expected to pick up steam again as major medical markets like Maryland, Ohio, Pennsylvania and Florida ramp up. Additionally, Michigan’s new recreational market is forecast to eventually bring in more than $1.4 billion-$1.7 sales as the industry matures there. Walsh added that since Michigan is in the Midwest, it could potentially have a ripple effect on other states in the region. Looking toward 2019, he predicted three more states are likely candidates to legalize adult-use marijuana, perhaps Illinois and maybe New York and New Jersey. He further suggested a sizable mainstream company might make a marijuana play in the U.S. next year. Torsten Kuenzlen, CEO of Calgary-Alberta-based Sundial Growers and someone who has spent 25 years in executive leadership positions at such companies as Coca-Cola and Molson-Coors, also keynoted at MJBizCon and gave his opinion on what is working to the advantage of marijuana businesses, and what’s not. On the pro side, Kuenzlen said legalization benefits far outweigh the risks, and economic opportunities abound where MJ is legal. He also pointed out that the emerging momentum for professionalization makes the future look increasingly bright. Slow and inconsistent local and global legalization. Significant cannabis research restrictions prevail. Many MJ cultivators are tending toward a “quantity over quality” idea. The short-term focus of many industry players. Some branding nomenclature currently used by marijuana businesses does not reach beyond people who have been traditionally viewed as MJ customers, and that needs to change. Kuenzlen said for the cannabis industry to move well into its next phase – which he suggested could mean up to a $2 trillion global market by 2050 – MJ businesses must think and act beyond the current day-to-day as well as focus on safety, quality and consumer trust. Also fundamental will be business partnerships in which holistic stakeholder relationships exist and overall healthy industry dynamics. The cannabis industry is undergoing a tremendous transformation. MJBizCon event is indeed to learn everything the industry is going through or offering. In case you’re running a cannabis business, you should be aware of such updates. Since every state has a specific rule, you need the help of a professional marketing company to promote your cannabis business as per these updates.